Celebrating the life of Alton "Al" Kruckeberg Sr.
Be the first to share your favorite memory, photo or story of Alton "Al". This memorial page is dedicated for family, friends and future generations to celebrate the life of their loved one. 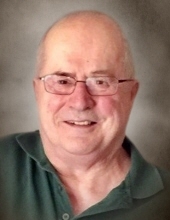 Obituary for Alton "Al" Kruckeberg Sr.
Alton D. Kruckeberg Sr., age 75, passed away peacefully surrounded by family on Wednesday, January 16, 2019. He was born on July 5, 1943 to the late Gilbert and Lillian (Schultz) Kruckeberg. On August 30, 1985, Al married the love of his life, Mary Ann (Danforth) Denny. Al enjoyed spending his free time with his family, whether that be driving around with Mary Ann, golfing with his kids, or especially time with his grandchildren and great-grandchildren. He was also an avid Packers, Brewers, and NASCAR fan and enjoyed playing cards and cribbage. Al is survived by his wife of 33 years, Mary Ann; children: Jerry (Sherry) Kruckeberg, Jim Kruckeberg, Bill Kruckeberg (fiancé Kyle Bates), Al Jr. (Tracy) Kruckeberg, Gilbert (Michelle) Kruckeberg, Michael Denny, Douglas Denny, Matthew (Patti) Denny, Pete Denny (fiancé Kris Danforth), and Donna Smith; step-daughter De Etta Wolfert; 27 grandchildren: Katie, Senaca (Kyle), Jordan (special friend Aria), Krissy (Ben), Kim, Amanda, Ashley, Alton III (special friend Bri), Steven, Amanda, Danny, Mariea (Derrick), DJ (Amber), Derick (Dahlia), Desmond (special friend Vicky), Stephanie (special friend Melissa), Jeffrey (special friend Michelle), Jamison (special friend Alley), Isiah, Asia, Marques Smith, Chantre Smith, Jacqueline, Michael, Kayla (Brad), Laurana, Terra; 34 great-grandchildren; sisters: Wanda (Doc) Prahm, Janice Cox, Patricia (Don) Schulze, Sharron (James) Ritchie, Lynn (Gary) Morack, and Kathy (Dave) Moderson; siblings-in-law: Betty Skenandore, Patricia (Harvey) Skenandore, and Eugene (Pat) Danforth; and many nieces, nephews, other relatives and friends. He was preceded in death by his parents; parents-in-law, Pete and Sabie Danforth; siblings-in-law: Bill, Tony, Reggie, Pete, and Cliff Danforth, and Yvonne (Frank) and Tony Skenandore; and grandson, Greg Smith. A visitation will be held on Sunday, January 20, 2019 from 2 p.m. until 5 p.m. at Ryan Funeral Home, 305 N. 10th St. DePere with a service officiated by Deacon Deborah Heckel at 5 p.m. Online condolences may be expressed at www.ryanfh.com. The family would like to give a special thank you to the staff of Unity Hospice, St. Mary’s Hospital, as well as Green Bay VA Clinic Milo C Huempfner. To send flowers or a remembrance gift to the family of Alton "Al" Kruckeberg Sr., please visit our Tribute Store. "Email Address" would like to share the life celebration of Alton "Al" Kruckeberg Sr.. Click on the "link" to go to share a favorite memory or leave a condolence message for the family.